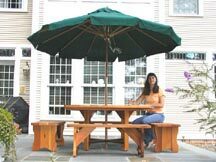 Our Umbrella fabrics are made with Sunbrella solution dyed olefin. It does not need any special care. It will not sun fade, mildew or have any problems. The worst thing we have seen is abundant bird droppings. To clean the Umbrella fabric: Use a garden hose and spray it. Step 1: Take the umbrella down and out of the table. Lay it flat. Unscrew and remove the finial. Step 2: The fabric is stretched around the wooden frame and held on by stitched in pockets. Just tug the fabric pockets off each of the eight ribs. Step 3: Wash the fabric in any washing machine on gentle cycle in cold water with soap. Step 4: Just to be on the safe side we stretch the wet fabric back onto the frame and raise the umbrella for drying.